The University Archives team recovered and restored an old marble plaque found on campus. Research done by Stephanie Gilbert, archives assistant, unearthed the story of the plaque and Laura Lee Henson. The first student to die on Henderson State University’s campus in 1914. 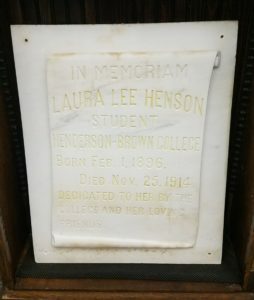 This plaque and more information on Laura Lee Henson can be found in the display on the first floor of Huie Library. Watch a video about Laura Lee Henson to learn more.